Vandalia Line locomotive 428 pulls a string of flat cars loaded with FB&D-type cars for delivery to New Orleans. 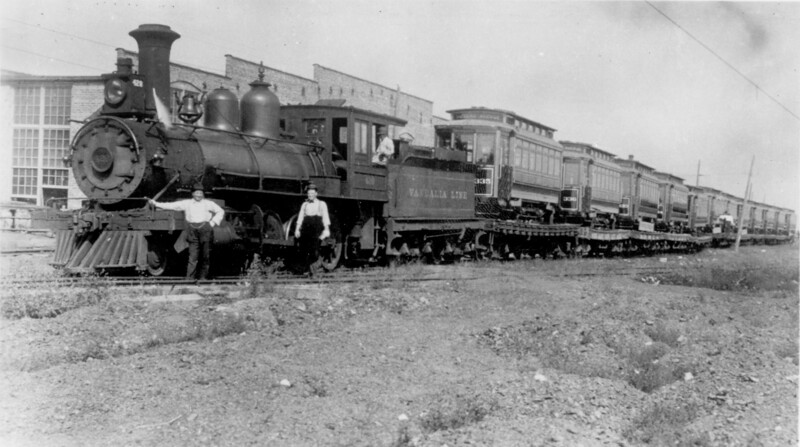 The first few cars behind the locomotive are numbers 335, 336, 333, and 334. Car 335 has a route sign “Peters Avenue” in its front clerestory glass; the glass was red with blue lettering. (Peters Ave. is now called Jefferson Ave.) These cars were part of the last group of FB&D cars for New Orleans. They were built in 1908 by McGuire-Cummings. Probably none of these cars became our car 29, which is about ten years older, but they all have the same design.